Do you long to pause from your busy live and reconnect with nature? 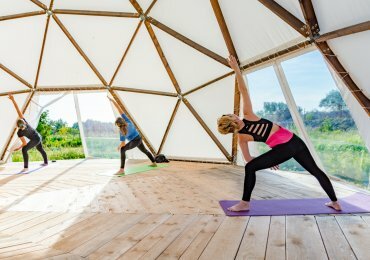 Enjoy our peaceful eco island retreat, complimented by yoga and guided meditations. Are you craving for time out of your busy life? Do you long to reconnect with nature and regain a sense of purpose? Here, at the island retreat camp Gea Viva, we believe that spending time in nature, can nourish your soul and restore your body`s balance. In essence, we humans have been an integral part of nature for most of history. Nature offers us a very special treasure – to attain home within ourselves. Join us to experience simple eco-friendly living, be inspired by our amazing unspoiled island landscape: marvel at the stars, enjoy beautiful sunsets and swim in crystal clear waters. Our Yoga and meditation sessions support you to relax into a flow of joy and ease, and attune to spirit. Uncovering deep truths about yourself, you will attain home within. We oiffer Yoga and meditation lessons on alternating days, apart from Wednesdays. Our Asana practice is a flowing dynamic, linked to your breath. This quickly releases stress and aligns you with your inner thruth. We strongly believe that Yoga is for everyone, no matter which age or shape, and will support you at whichever level you are, from beginners to intermediate practicioners. In mindful meditations, you will learn to communicate with nature, deepen your connection with supreme consciousness and access your own inner truth and deeper knowing. 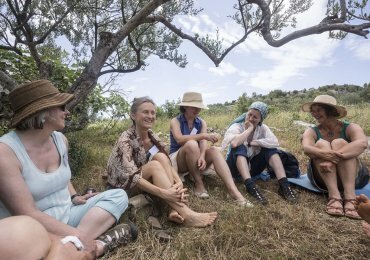 Yoga and meditation sessions are led by Sabine Engelhardt, the initiator of the Gea Viva project, and others. Vegetarian breakfast is included in this offer. If you have special dietary requirements, please let us know in your enquiry. We have a fully equipped kitchen you are welcone to use to prepare vegetarian meals here. Private yoga or meditation lesson per hour 500 HRK/65 Euros. To secure your place on this programme, please pay a deposit of 20% of the value of your stay. Payments are by bank transfer in Croatian Kunas (HRK) or in Euro or in cash. Please bring comfotable clothes for Yoga, sturdy shoes, a sun hat, sunscreen and a towel.